Uva ursi (Arctostaphylos uva-ursi) is used for its astringent properties and the numerous indications for which astringents are utilized (e.g., hemostatics, tonics, etc. ).It is one of the most commonly used urinary tract disinfectants in modern herbal medicine, with evidence of historical usage dating back several centuries. While never reaching superstar status, uva ursi leaves are used in nearly all herbal formulas for the health of the genito-urinary system. 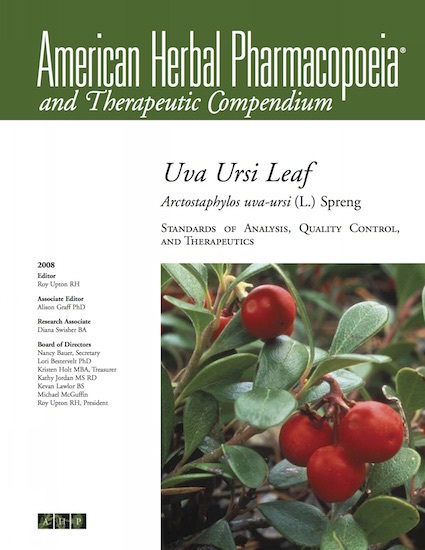 The available data on the safety and efficacy of uva ursi are provided in the AHP monograph. Most notably, there has been concern and misinformation about the herb’s content of hydroquinone, its use in pregnancy, and combining it with other botanicals for urinary tract health, such as cranberry. The monograph addresses each of these controversial issues in detail. Uva ursi leaves are also subject to widespread quality issues, often with other adulterating species of either Arctostaphylos or Vaccinium leaves, or deteriorated leaves. These quality issues are also thoroughly addressed.